COSMAS MURUNGA was always proud to show off his mud-walled home, set in a clearing on the wooded slopes of Mount Elgon; to explain how his people coexisted with, and cared for, the forest and its wildlife on the border with Uganda. But that home is no more, burnt to the ground by around 50 Kenya Forest Service (KFS) rangers and police, along with 200 other dwellings, on June 20th and 21st. “We lost everything,” he says. However, it has proven extremely hard. Rwanda, for example, rolled out a programme over three years, whereby local surveyors worked with land owners and their neighbours to demarcate and register 10.3m parcels of land. By the time the scheme was completed in 2013, 81% of plots had been issued with titles, at relatively low cost; investment and women’s access to land have both improved. But even a relatively well-organised place like Rwanda has had problems keeping records up to date when land is sold or inherited. Africa’s rickety infrastructure does not help. Where there are no roads or warehouses to help get crops to market, many of the benefits of formal tenure will go unrealised. And legal property rights offer less protection in countries where big men can flout the law with impunity—a particular problem in Africa. Customary rights have the advantage that they already exist, people understand them and they offer at least some security. “Law and policy should recognise what is working on the ground. So if it is customary rights, so be it,” says Esther Mwangi of the Centre for International Forestry Research. A USAID survey conducted in Ethiopia, Guinea, Liberia and Zambia found that less than a third of people had experienced land disputes. About the same number thought confiscation of, or encroachment on, their land was likely. That suggests that their property is far less secure than it would be in any rich country, but not as insecure as one might expect, given that less than 10% of households have any documents proving their land ownership in the latter three countries. In recent years land grabs have sometimes made a mockery of customary ownership. In Ethiopia, all land is still officially state-owned. The government has successfully registered customary rights in some regions: about 30% of Ethiopian households now have such documents. But it has also leased to foreign investors large tracts of land in Oromia that have traditionally been used by smallholder farmers for growing crops, grazing livestock and collecting firewood—and brutally suppressed the protests that erupted as a result. In Ghana chiefs have used their right to administer communal land to sell large tracts without their community’s permission. Property rights are even less respected in Zimbabwe. Over the past decade and a half, Robert Mugabe’s government has seized most of the country’s commercial farms with little or no compensation. Traditional chiefs have also sold communal land to private firms, leaving many peasants destitute. In South Africa the ruling African National Congress (ANC) has generally been trying to weaken individual land rights by declaring more land “communal”. This puts it under the control of chiefs and shores up the ANC’s rural support, since people afraid of being evicted tend to vote for whomever they are told to. In several places custom dictates that only men can inherit land. In Uganda stories abound of widows being turfed off their marital land by in-laws. One woman was thrown out of her home a week after her husband died in an accident; she had refused to marry any of his five brothers, and her children were taken away to a sister-in-law. Individual land ownership is often ineffectual for forests and rangelands, which lose their value when parcelled up. There is evidence that recognising the communal rights of indigenous forest communities can mean their lands are conserved better. 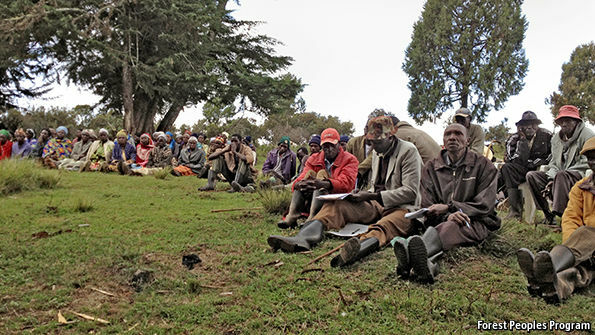 Around Mount Elgon successive governments have argued that, when evicting the Ogiek, they were protecting the forest and the rugged moorland above it to make way for a national park and forest reserve. Yet where the woodland is under the control of the KFS, whole areas have been razed to rent out to maize farmers. The Ogiek, by contrast, graze their cows in glades and above the tree line, relying on the forest to provide honey and medicine. Land rights are still a combustible issue in Kenya. The constitution of 2010, which recognises customary tenure, was passed after the post-election violence of 2007-08, sparked in part by politicians inciting Kalenjins in the Rift Valley to attack Kikuyu “squatters” who had migrated there for work. The constitution may help the Ogiek fight their corner. But until the men in power respect the law, the law can do little to protect property rights. Could Mmusi Maimane Be South Africa’s Next President?